Posted in CD, Downloads, Instruction, Music. • Immediate download of the audio is available after payment is received. • When you purchase the download, a download page will appear immediately after you complete the transaction. The download link will also appear on your invoice which will be automatically emailed to you within minutes, if not instantaneously. • The download link is active for 48 hours after purchase. If you don’t download it before the link expires, contact us and we’ll make sure you receive the files. Carolyn Wing Greenlee has instructed hundreds of people to sing, and experienced singers to use their voices to their greatest potential. Most have simply not had the tools needed to strengthen, stretch and tune their voices effectively. Everyone can improve with effort and understanding. 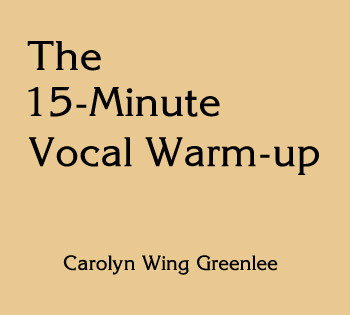 These exercises are for warming up the voice and developing its capabilities. The 15 minutes of warm-ups are designed to stretch your range, both higher and lower, to create strength and resonance in the upper range and flexibility and lyricism in the lower range. The exercises are beneficial for all styles of singing in any musical genre. An 8-page booklet provides explanations of how the voice works and what it takes to improve the quality and control of your voice. A simple explanation of each exercise is also provided. An unusual part of this CD is that the voice doing the exercises is not perfect. Instead of demonstrating only what should be, it also shows what you can expect if you are not strong and controlled. While you’re learning and growing, you’re bound to make some ugly noises. Don’t feel embarrassed, that’s simply part of the process.